» 300 pounds of Classic Hill Gold. Early in the 1850’s, Englishman John Titus came to the wild Klamath River area to mine for gold. He staked a mining claim along a small creek which would later bear his name. Titus Creek flowed down a long and high ridge southeast of Happy Camp, now called “Titus Ridge.” John Titus was my great-great grandfather. 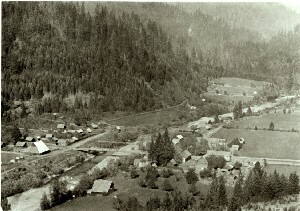 Titus also mined gold from the rich gravel bars along the Klamath River and Indian Creek. In 1857, he and another miner friend decided to do more than “just be gold miners.” John Titus and James Camp purchased, from Richard Humphreys and Lewis Barnes, the buildings and the Klamath River Ferry at the mouth of Titus Creek. Ferry Point was the location where early miners used a horse-drawn ferry to cross the broad river. Humphreys was a full-time horse and mule packer, bringing freight and supplies to the gold mines from Trinidad and Crescent City. 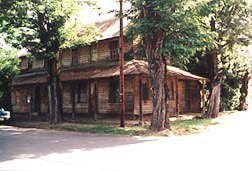 Humphreys also owned a store and other businesses in Crescent City. Humphreys and Barnes had tried to operate a trading post at the mouth of Titus Creek, but neither had time enough to do so. Packing supplies and digging for gold took too much time! Titus and Camp saw this situation as an excellent business opportunity. They could make money by mining for gold themselves, besides selling food and equipment to the miners. This combination worked very well indeed. John Titus married my great-great grandmother Julia, a Karuk Indian lady, native to the Titus Creek area. (Julia’s name in Karuk language was Quamshu, meaning “Springtime.”) Titus and Camp worked hard at both mining and storekeeping. Their hard work made the business profitable. Partners still; in 1865 Jim Camp and John Titus bought land and a corral from Martin Cuddihy, the new owner of the “American Hotel.” (This hotel is believed to have been built by Albert Doolittle, somewhere around 1860. Now known as the “Baker Hotel,” it still stands in downtown Happy Camp.) They built a large brick building and moved their store’s business from Ferry Point to Happy Camp. This store was named “J. Camp. Merchandise,” and advertised “Crockery, Glassware, Drugs, Hardware, and Cutlery.” Jim Camp’s brother, Heil Camp, worked as clerk and manager much of the time, thus giving Titus and Camp more time for other ventures. This building is also still standing in Happy Camp, California. Titus and Camp bought a sawmill from a party named Staples in the mid to late 1860s. The sawmill was on land now known as Curly Jack Campground, 1 1/2 miles south of Happy Camp. Logging with horses; sawing lumber with a water-powered sawmill; and then selling that lumber were profitable enterprises. Much lumber was needed for homes, barns, outbuildings, bridges, and miners’ ditch flumes. Separately, both Titus and Camp owned other mining claims near Happy Camp. As partners, they bought several adjoining claims from other miners, combined them into the “Classic Hill Mine,” and filed for mineral patent in 1872. A government surveyor arrived to do the land survey required to file for patent. A U.S. Mineral Monument was set in a rock outcrop near Indian Creek. It was tied by “solar shot” to the nearest known survey corner; thirty miles away in Scott Valley! U.S.M.M.# 6 (United States Mineral Monument #6) was the “true-point-of-the-beginning” of and the southeast corner of the Classic Hill Mine survey. Dutchman Benoni Swearingen, another of my great-great grandfathers, was Head-Chainman for the United States Government Surveyor. This interests me because around ten years previously, Benoni had traveled around Oregon chasing “Gold Strikes.” I have a copy of the handwritten letter he wrote earlier from Oregon City, Oregon, to his wife, my great-great grandmother Elizabeth; back home near Indian Town. He wrote of gold, all right, but also sickness, muddy living conditions, a shortage of food, and too many gold miners. He wrote that (if he survived the starving town and cold-water rheumatism,) he would rather be back home on Indian Creek, even if he were only making twenty-five cents a day! The Classic Hill Mine proved to be extremely rich for Titus and Camp. It was only 1 1/2 miles from the homestead on Swearingen Gulch! 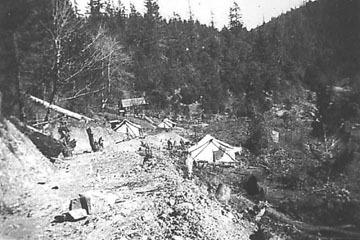 It would have been even more convenient if he could have found gold here before he had spent time “wandering around in Oregon.” The Classic Hill Mine turned out to be one of the better known, rich, gold-producing mines in Siskiyou County! Benoni and Elizabeth were married in Indian Town in 1856. This was a gold boom town, only one mile from Classic Hill. Indian Town residents outnumbered the population of Happy Camp for years. It had saloons, hotels, stores, butcher shops, bakeries, and even a bowling alley. Indian Town was located on the banks of Indian Creek, half way between the Swearingen Homestead and the Classic Hill Mine. It had gone from “Boom to Bust” before the rich Classic Hill Mine was located. Ambitious miners kept mining the gold-rich Indian Town gravels until they eventually tore down the entire town in order to get the gold out from underneath the town! Nothing but gravel and alders now remain at Indian Town. Classic Hill Mine is in the foothills of timbered ridges that rise north of Happy Camp and continue into the Siskiyou Mountains. 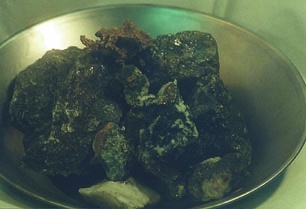 This mine is located in geologic strata and soils closely related to those of Indian Town. Gold and gravel traveled downstream from Classic Hill to Indian Town over many millennia. Elevations in this area range from 1,800 feet at the foot of the Classic Hill, up to 7,310 feet at Preston Peak, “Master of the Coast Range.” The Siskiyou Mountain Range runs east and west, connecting the Cascade Range to the California Coast Range. 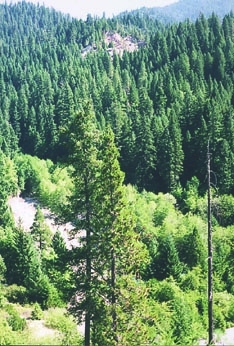 Little Grayback Mountain connects to the west and Soda Mountain connects to the east. Seven types of soil family-groups can be found within two miles of the Classic Hill. Three groups are derived primarily from Clalam soils of fractured metamorphic rock, including “Clalam and Deep Riverwash” along Indian Creek. Two types of soil materials are derived from Serpentinitic bedrock, and the other two soil types found near the Classic Hill Mine; “Holland Mixed Landslide” at the mine site, and “Holland-Clalam-Coboc” soils upslope of the Classic Hill Mine. It is fascinating to consider how all of these very different types of soil have ended up so closely together after being uplifted by plate tectonics, worn down by weather, plowed by glaciers, and washed-about by raging waters. Here is where John Titus and Jim Camp found truly large amounts of gold. Today, you can walk the mine (it’s privately owned; so you must get the owner’s permission to prospect it) and see gravelly, loam soils varying in color from brown to pink. You can still see outcrops of fractured metamorphic rock. Most important, you can find pockets of river-washed gravels that have been collected in holes and depressions of the terrain over millions of years. Many of these gravel traps collected gold along with the gravel. Gold virtually filled some of these pockets, but “digging,” following the gold-rich gravel pockets, was a lot of work. Titus and Camp hired more men. Titus and Camp found $20,000 in gold nuggets in just one of these pockets. Gold was selling for around $15 per ounce back in about 1880. I don’t know for certain, but I remember Mom, Dad, and Grandpa Bab Titus talking about it. I heard prices that varied from $13 to $18 per ounce. At $15 per ounce; $20,000 is about 1,333 ounces of gold! Gold was so obvious and so easy to pick up in certain portions of these gravel pockets that guards were placed there day and night. All miners at the Classic Hill Mine were thoroughly searched as they left the diggings; including being searched for stolen nuggets hidden in shoes, socks, and hollow teeth! A mule trail, or pack trail traveled directly across Classic Hill. Horace Gasquet (a packer and founding businessman of Crescent City, Gasquet, and Happy Camp) established this pack trail. It served Indian Town, Classic Hill Mine, and Happy Camp; traveling to Waldo, Oregon, via Big Meadows (now called Poker Flat,) and Little Grayback Mountain. From Waldo, a person could travel down the Illinois Valley to the Rogue and Applegate Rivers, and continue onward to Jacksonville. In the 1880’s Jacksonville was one of the largest and most well known gold boom-towns in the west. 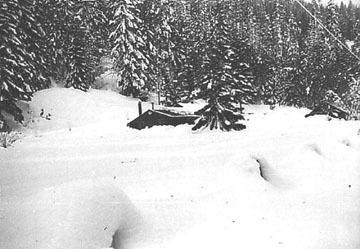 This “Waldo Pack Trail” is the same one that was used to deliver beef cattle and hogs from the Bybee Ranch and others in the Rogue and Applegate Valleys. Cowboys would meet the miners at Big Meadows to exchange gold for food and animals. This same trail, winding through Siskiyou Mountain timber, was also used to deliver gold from Happy Camp and Indian Town to gold buyers in Oregon. Jacksonville, I believe, is where Titus and Camp sold their largest pack-train load of gold. 4,200 ounces of gold, loaded on a pack train of horses and mules, guarded by wranglers armed with rifles and handguns, were packed out in one trip by my great-great grandpa and his partner to sell in Oregon! That’s over 300 pounds of Indian Creek’s Classic Hill Mine Gold Nuggets!